Missed one of our programmes? had to work or slept in? Don't worry. Now you can catch up with some of our past shows by clicking on the "Listen Again" button above. Listen when it suits you and enjoy our storytellers and their tales at any time. Every month, I will upload another programme. Just imagine if you learned all the stories told by our tellers. Why you'd be ready to start telling stories yourself. And who knows, maybe you'll be my next guest. If you're a storyteller, get in touch. Use the "Send Voicemail" button to the right or send an email to iamthestoryteller[at]gmail[dot]com. And if you're an avid listener, get in touch and let me know what you like. And don't forget to subscribe to the Teller and the Tale newsletter. That way you'll never miss who's on and when. 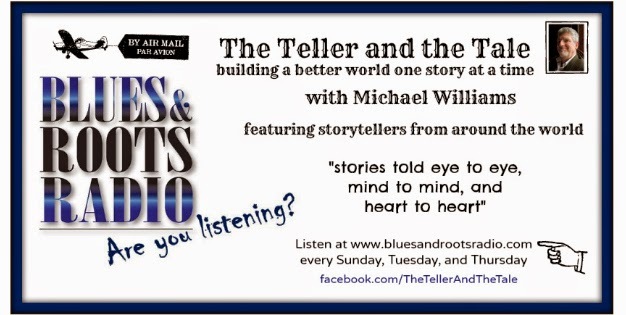 Meanwhile, why not go to the "Listen Again" page and enjoy one of your favourite storytellers or discover someone new. It's storytelling told "eye to eye, mind to mind, and heart to heart."